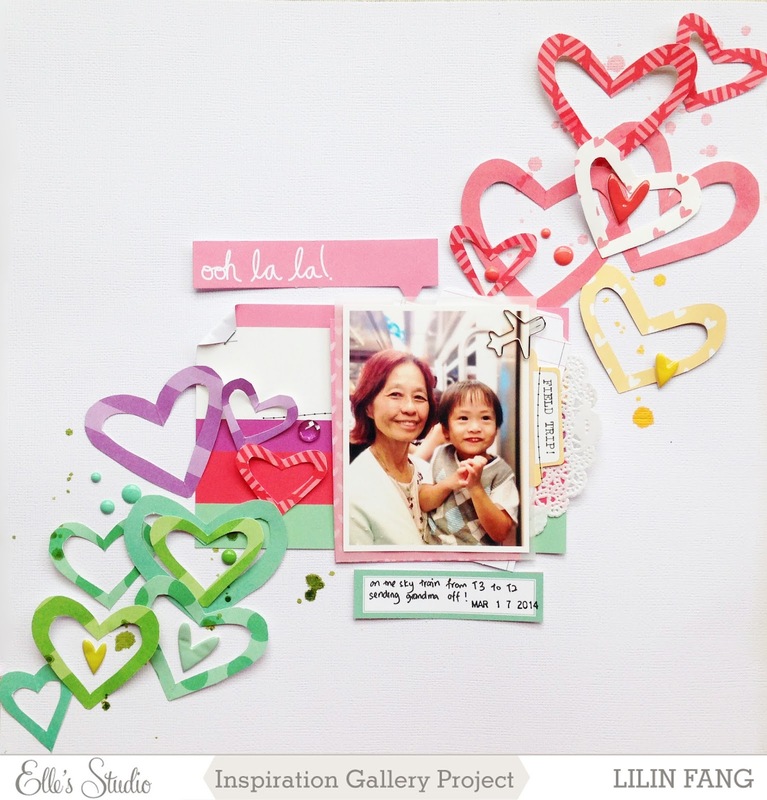 elle's studio exclusive april kit and inspiration gallery is now live! here's a look at the april kit! love the colors of the kit this month! i also love that mother's day tags are included so i can start making mother's day cards early! 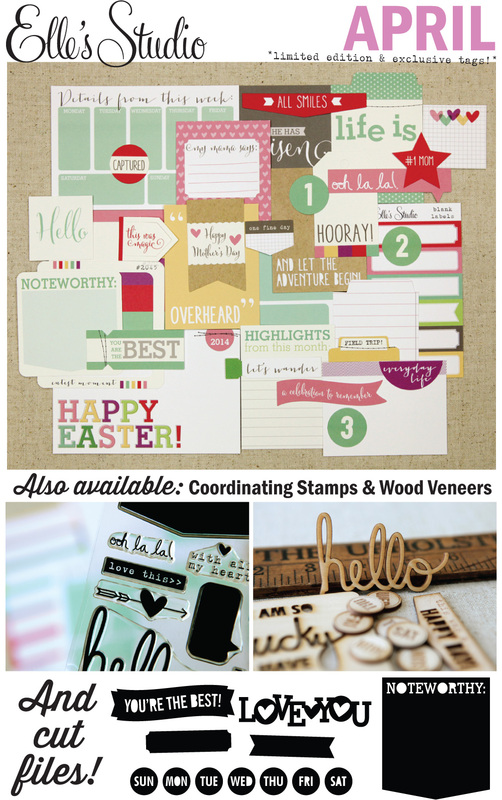 you will also be pleased to know that coordinating stamp, wood veneers and cut files also available! i started this page by pasting 3 pages of an old book on white card stock and painted some gesso over the pages. then i used the heart stamp from love you more collection and created a background with inks in various colors. after adding my photo, i had lots of fun embellishing the hearts. to finish off this layout, i then added my title, journaling and some ink splatters with mister huey mist. the starting point of this layout is the rainbow card from the kit. i place it in the middle of a white card stock and started fussy cut some hearts using patterned papers that coordinate with the colors on the rainbow card. i used patterned paper from love you more and 2014 collections as the different color tones and prints give some dimension when the hearts are arranged together. for my photo, i layered it with vellum, doily and some cards from the kit. at this point, i thought the design looks a bit plain, so i added some ink splatters and embellishments. to finish off, i added a label with my journaling. 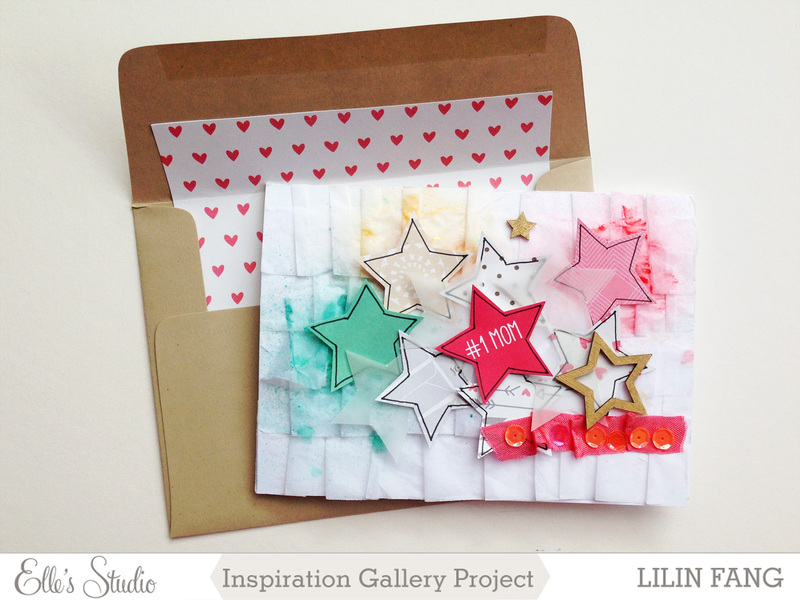 i love the #1 mom star tag from the april kit and wanted to use it to make a mother's day card. i first covered the white card with a layer of white tissue paper. i then fussy cut stars from patterned paper from the love you more collection and vellum. as i arranged the stars on the tissue paper, i thought the card looked a bit plain so to added some mist to further highlight the colors of the patterned papers. i choose to highlight gold, green and pink here. to make the stars stand out more, i drew outline on each of them. to finish off the card, i added some star wood veneer from everyday moment, a pink ribbon and some sequins. i also created a coordinated envelope by adhering a piece of patterned paper to a regular envelope. thank you once again for dropping by! happy shopping and see you soon!